In most cases this happens when your broker use currency suffix and the trade copier was not able to detect it automatically or detected it incorrectly. To solve fix this you need to set the suffix manually using the CurrencyNameSufix option and also set the TurnOffAutoSufixDetection option to TRUE. This usually can happen when your broker has more than one symbol for the same currency pair, for example EURUSD and then the same pair with some suffix at the end like EURUSD_Ask. Another reason for such error can be when trading on some or all pairs is disabled by your broker. Trading might be disabled temporarily or permanently. Maybe it’s your new account and your broker needs to enable auto trading option on their side. You should contact your broker about this if the 1st solution did not help. Also there were cases that clients got the same error because of a poor Internet connection on their VPS server or computer. 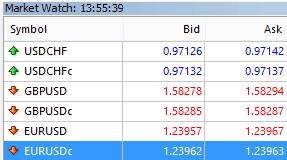 In any case, you can always try to open a position manually on the same currency pair and see if it works. If you get the same error then probably trading is disabled for that pair and only your broker can help you with this. Please like and share if this video was helpful to you, and tell me what you think in the comments below! If you have any more questions watch other videos on my MT4 Copier Blog or contact my support team.